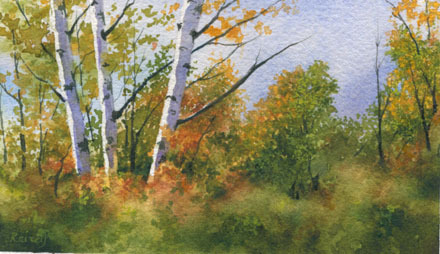 I painted these autumn Birches a couple of years ago and was amazed when it actually came out the way I’d hoped. At the time I reveled in my little success and now I’d like to figure out how heck I did it! I’m the type of person who learns visually and learns through repetition. I’ve also learned that one “success” can be repeated and lead to another only if I push myself to practice and repeat my technique over and over again until I’m completely comfortable that I can duplicate that subject or technique. Unfortunately, at the time I painted this little piece I didn’t do the prep work and note taking that I’m more apt to do these days. But as a visual learner what I can do now is get out my reference material and become familiar with my subject – really familiar. Maybe I’ll get in the car and find some beautiful Birches alive and in “person.” Most importantly, I must see – truly see – paying attention to how Birches grow, observe the patterns and lines on their beautiful white bark, how their branches reach for the sun and then paying particular attention to how the light filters through the leaves! That’s how I’ll need start again and I will because I absolutely love the creative process. With its frustrations and challenges I’m in love with art – both creating my own art and observing the art of others. It excites me and brings a peace that surpasses all understanding. I’m grateful beyond measures for this gift of creativity and the urge to figure it out over and over again!